Happy Chinese New Year! Today mark’s the most important of all Chinese holidays and is celebrated around the world. In China, it is known as “Spring Festival”. 2012 is the year of the Dragon which is one of the 12 animals of the Chinese zodiac. The Dragon is the only animal in their zodiac that is based on legend and it symbolizes luck. 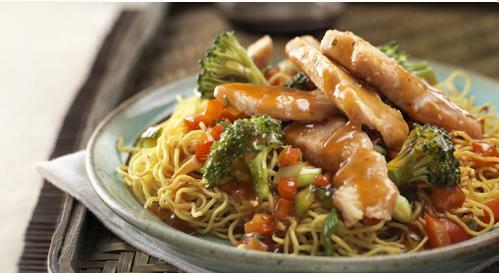 VH Sauces is getting into the Chinese New Year spirit with some tasty recipes on their website. Think bright and colourful dishes to celebrate this special occasion like Chicken Yet-Ca-Mein with Crisp Vegetables and Vietnamese Garlic Beef. They have 184 recipes on their website. I’ve bookmarked a bunch of them that I want to try. Last week I made a delicious Beef Stir-Fry with the VH General Tao Stir-Fry Sauce. I cooked the beef in Sesame Oil for an even more authentic Asian flavour and added in the VH Sauce to the mixture. It tasted delicious served over a bed of rice. I saved a bit of the sauce to add to the rice for my flavour. It’s a quick and easy meal that is delicious and satisfying! I’m looking forward to trying out some of the other VH Sauce flavours. I think the Garlic Hoisin Stir-Fry Sauce will be the next one we try. Knowing me, I’ll end up trying them all because I love to experiment in the kitchen. I have tried the VH Steamers which are Asian-inspired frozen entrees that are ready in 5 minutes in your microwave. They are so fast and easy to make. They have six delicious flavours including Honey Sesame Chicken, Chicken Teriyaki, Kung Pao Chicken, Shanghai Ginger Beef, Thai Chicken & Shrimp and Zesty Orange Chicken. If I was still working outside the home, they would be perfect to bring with me for my lunch at work. Check out the freezer section of your local grocery store and give them a try! One lucky Canadian reader is going to win a Chinese New Year gift pack valued at $60 from VH Sauces! Disclosure – I am participating in the VH Chinese New Year Celebration program by Mom Central Canada on behalf of VH. I received compensation as a thank you for my participation. The opinions on this blog are my own. I really like sweet and sour. And, today I went and purchased a few different ones to prepare for a week of trying new dishes. Hi I like sweet and sour but anything garlic is great too. My favorite VH sauce is the Orange-Ginger Stir Fry Sauce. Love the sweet & sour stir fry sauce…make a great baked pork chop recipe with it! I love the asian 5 spice stiry fry sauce! Kung Pao Chicken sounds good and it has whole grains! I love the Garlic Hoisin Sauce. Great for a quick stirfry. My favourite sauce is Sweet & Sour. Always looking for a new sweet and sour sauce as well as a garlic sauce that is not so garlic-y. I would like to try the orange-ginger stir-fry sauce, they all sound so tempting! yummy! the Kung Pao Chicken steamer looks good! Thanks for the chance! My favorite VH sauce is the Cherry VH sauce..yum! My favorite is sweet n sour sauce. My favorite it General Tao Stir Fry Sauce!! My favorite is the Teriyaki Stir Fry Sauce. I would like to try the Garlic Hoisin stir fry sauce. My favourite is the Sweet Thai Chili Sauce! My favourite sauce is the Sweet & Sour sauce. I would love to try the Teriyaki or the General Tao! 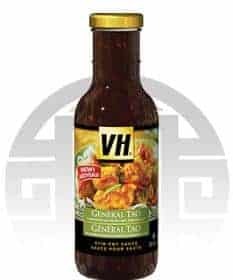 I love VH sauces I often use General Tao sauce to make stir fry. My favourite sauce is sweet and sour, I love it with chicken! I love the medium dry garlic sauce. I like the butter chicken sauce. The Indian Market Tandoori Sauce looks amazing!